MW Mobile Blog: Catching a few blugs for dinner. Caught a few more for our farewell fish fry tonight. Obligatory frying bluegill picture. Tried some of the creole seasoning on some of the blugs. Dad said he couldn't taste the difference. 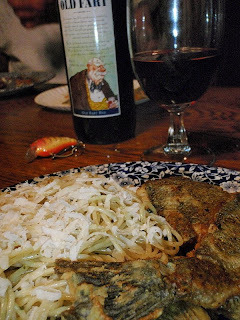 Fried bluegill and a side of pasta with garlic, olive oil, and parmesan cheese. We cooked 14 fish, and each ate 4. Six blugs are left for lunch and breakfast. I continue to receive widespread criticism for my preferred way of preparing bluegills vs the more common practice of filleting the blugs. In defense of my gutting, de-finning, and scaling methodology, I offer this photo into evidence. This is what I call a post-fry bluegill fillet. 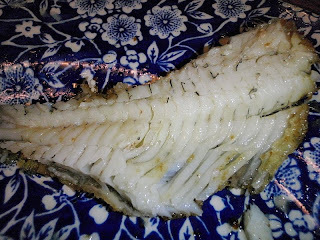 Note that bones have been lifted cleanly out of the fish, leaving a boneless fillet on on the plate. 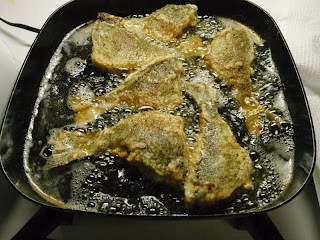 As a result of using this method of preparation, the fillet is only breaded and fried on one side, thereby avoiding the "potato chip effect" so prevalent with smaller bluegill fillets. Moreover, more meat is preserved and the thin layer of fat under the skin leaves a more flavorful, moist and flaky filet. This is a far superior way of preparing bluegills. The only downside - one must use one's fingers to ensure proper deboning and enjoy the fried bluegill properly. 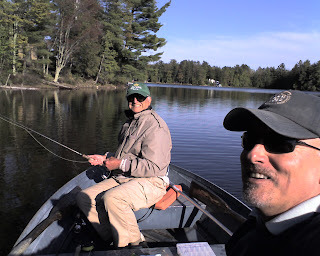 Post Script: I was going to prepare another "Fish Fry" movie, but decided it would be exactly the same as "Fish Fry 2008 - We Eat Bluegills" or even "Fish Fry 1992 - The Lament of Sasquatch". It is difficult to do something new with a fish fry movie. did you find my hat ? I think it is in one of the three places. Tomorrow is cleanup day. If it is (1), we'll find it tomorrow. However, since it has not shown up here so far, I am not optimistic. If (2) you will find it on your next visit. Unless - Someone else finds it there first and claims it under the prvisions of international salvage law. I actually think this is the most likely scenario, as you started whining and crying about your missing hat shortly after we got back from lil' camp. I though I would check there on Monday, when MK and I were planning on going there. But we didn't go. So if it is there, you are screwed. If (3) - I cannot help you. That is all. Please bookmark this comment, so if you have any more questions about your hat, you can reread this comment as often as necessary.